it's 6x6, which is what I wanted. If you look at the specs you get a nice camera: 6x6 format with shutterspeeds ranging from B to 1/1000th of a second and no need for batteries. 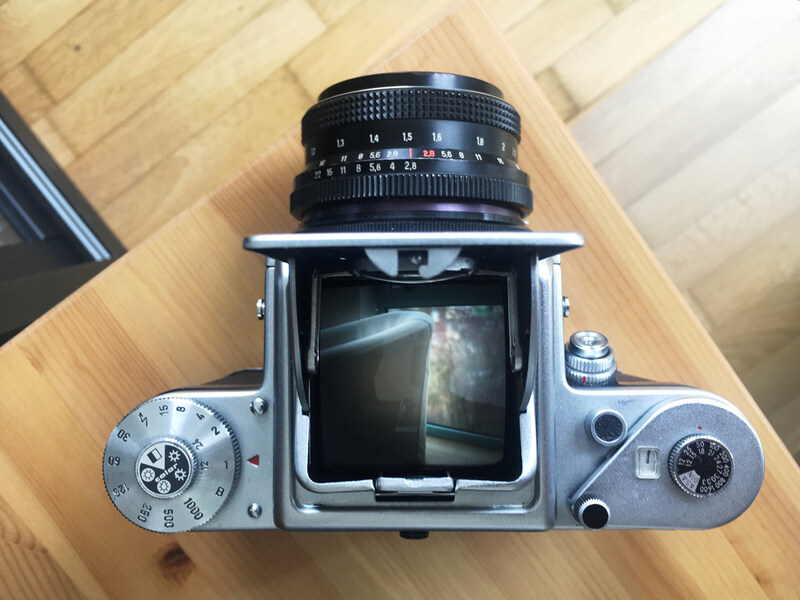 The ergonomics are mix between the classical waistelevel-finder box-design you see with Hasselblad, Rollei etc. on the one hand and a more common SLR design on the other hand. In fact: with an added prism it becomes much more of a "normal" SLR. For those curious about the system, this website rovides an overview of the Pentacon Six system. When you first take up this camera it feels solid in the way cameras used to feel back before things were starting to be made of plastic, the same goes for the lens. As far as lenses go I've only used the 80mm Biometar and I'd say it's a fine lens that will get the job done. Is it inferior to something like the 80mm Planars you find on Hasselblads and Rolleiflexes? Very likely. Does hat even matter? I guess that depends on what's important to you. My experience was mellowed by the fact that the camera I got was broken in the - as far as I am aware - most common way out there: the film-advance and frame-counter don't work propperly. Also a bit later I found that some speed (1/250th and 1/500th) don't work correctly as well. So the one downside is this: you have to make sure you get a camera that works properly (maybe it's best to buy from a dealer who explicitly states that all functions have been tested) and then make sure to read up on what not to do so as not to harm the camera. The second downside to my mind is the viewfinder: it reminds me of a sixties TV set, curved and very reflective and this hard to focus without a split-prism screen in a lot of lighting conditions. In the end I had a bad run with this, but that doesn't disqualify the system per se. It sure has it's weaknesses, but so do other camera-systems. If you look on flickr you will find people who do great stuff with these cameras, so I really wouldn't discount them when you are looking for an affordable entry into medium format. Personally my road will most likey lead towards a system like the Hasselblad V-System or Rolleis SL66, but I still find it great that this system is out there.